Accurate and reproducable results for rotational force. Accurately Calculate Centripetal Force using the sensitive balance between the inertial force on a rotating mass and the elastic force of an extended spring, this unit provides the data necessary to calculate centripetal force. When the apparatus rotates, the centripetal force required tomaintain the mass in its circular path is provided by the attached, adjustable-tension spring. 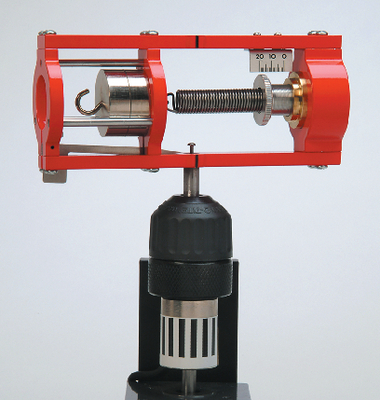 At low speeds the spring easily provides sufficient force, but at high speeds it is too weak. The point of balance of these two forces is indicated by a sensitive pointer that’s visible at any speed during rotation. You adjust the speed until the pointer is just opposite the index, so the centripetal force exerted by the spring and the reaction of themass on the spring are equal. With the pointer stable opposite the index, determine the rotational speed using the revolution counter or meter attached to the rotator. An instruction book shows how to determine centripetal force. Ordering information: Use only with our CENCO Rotator.